Backed by the profound experience of the industry, we are offering Regular Carton Sealing Machine. These are designed and manufactured under the supervision of our professionals using high grade quality raw material in adherence with the industry standards. 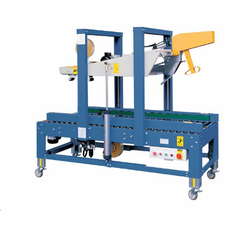 The offered machines are widely used for packaging of various sizes and shapes of boxes. Our team of experienced professionals makes us the leading suppliers of Heavy Duty Model Carton Sealing Machines to our national and international clients of good quality as well as of international quality standards. Carton Sealing Machines are mainly for the purpose of sealing in many industries like textile, food, chemical, cosmetics and pharmaceutical. These machines are designed by us by using cutting edge technology. 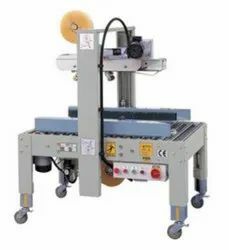 This machine adopts top and bottom/top & side belt drive, suitable for heavier carton packaging load. Side auxiliary device can fix the carton position in order to make sure the carton delivering smoothly & perfect centre taping. The strength (Pressure) of taping head and working table height can be easily adjusted. Overlap of the tape on the sides of carton can be adjusted within the range of 50~80mm. With firm commitment to quality, we are involved in manufacturing and supplying Self Adjustment Carton Sealing Machines. 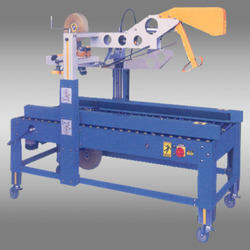 Our offered machines are designed and developed keeping in mind the needs of varied customers. Customization of our range is offered by us in order to meet the requirements of customers. These machines are applauded in the market for their features. It is suitable for automatic production line delivering varying carton sizes. 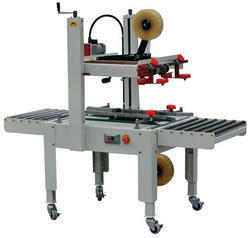 Owing to our sophisticated manufacturing facility, we have been able to offer Automatic Carton Sealing Machines. Designed and manufactured by the professionals of our firm in compliance with industry standards. These sealing machines utilize instant heat for various industrial purposes. Moreover, our offered machines are basically used for sealing various pharmaceutical, pesticide and food products. When the carton is fed into the machine, the machine will fold the carton's front flap, rear flap and side flaps automatically thereafter the taping onto the carton is done. The height and the width of the carton can be adjusted manually by the lead screw, mechanical adjustment. This machine is suited for the batch type of automated production line. We are the noted suppliers of Carton Sealing Machines. These type of machines serves their purpose in many industries like food, chemical, pharmaceutical as well as cosmetic. 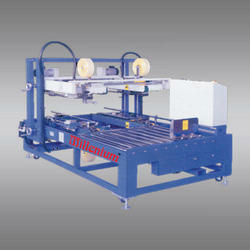 Carton Sealing Machines manufactured and supplied by our organization are in great demand in international market. 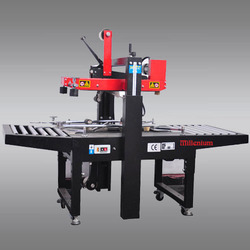 These machines offered by are also available in the market at industry leading prices. The top flaps of the carton will be automatically folded and be sealed simultaneously. suitable for automated production/packaging lines. Our firm specializes in providing a quality array of Carton Sealing Machines. 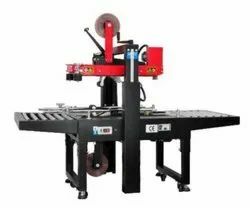 We are engaged in supplying these machines of various types, grades, sizes and specifications catering to the requirements of our esteemed customers. These machines have a great market value and we can provide complete satisfaction to our clients by providing them with these machines which are durable and long lasting in nature. The width and height of carton are adjusted by means of a lead screw. 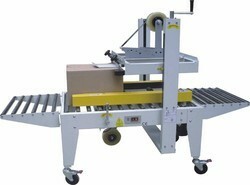 The machine is suitable for sealing the edges of the carton. • Easy Operation, just push box release. • Heavy-Duty body beautiful Powder-Coating Paint Finish. • Robust machine design long-working trouble free life. • Freely movable on castor wheels, wherever your packing work is done. • Robust machine design long-working trouble-free life.